These are the artists in the classical genre. They are not all from the Classical Era, but are special and appear here. 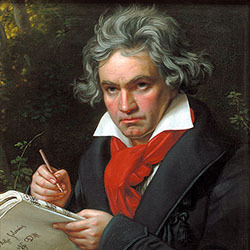 Ludwig Van Beethoven. There is no authentic record of the date of his birth; however, the registry of his baptism, in a Catholic service at the Parish of St. Regius on 17 December 1770, survives. He died on 26 March 1827 in Vienna at the age of 56. More info on Beethoven can be found here on wikipedia. Frederic Chopin lived from 1 March 1810 to 17 October 1849. He was only thirty nine when he died. Chopin was a Polish composer and virtuoso pianist of the Romantic era who wrote primarily for the solo piano. More information about Chopin can be found here on wikipedia. Wolfgang Amadeus Mozart (27 January 1756 – 5 December 1791), was a prolific and influential composer of the classical era. Mozart showed prodigious ability from his earliest childhood. Already competent on keyboard and violin, he composed from the age of five and performed before European royalty. More information about Mozart can be found here on wikipedia. Antonio Lucio Vivaldi (4 March 1678 – 28 July 1741) was an Italian musical composer, virtuoso violinist, teacher, and priest. Born in Venice, the capital of the Venetian Republic, he is regarded as one of the greatest Baroque composers, and his influence during his lifetime was widespread across Europe. More information about Vivaldi can be found here on wikipedia.